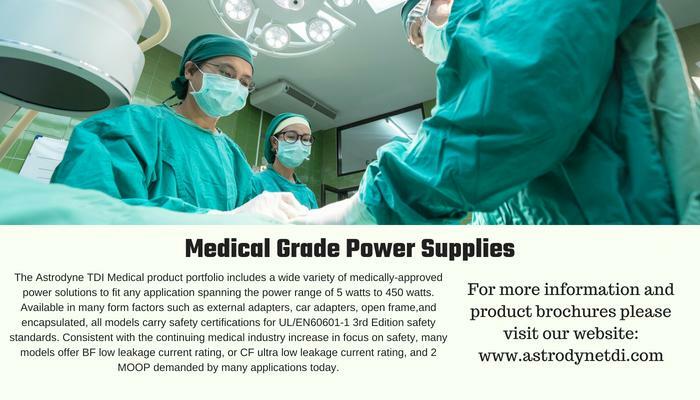 Astrodyne Medical Grade Power Supplies » HHP Associates, Inc.
Astrodyne TDI solutions power medical products which deliver life sustaining, life saving and quality of life improvement to customers who depend on highly reliable power solutions to meet their exact needs. The Astrodyne TDI medical product portfolio includes a wide variety of medically-approved power solutions to fit any application spanning the power range of 5 watts to 450 watts. Available in many form factors such as external adapters, car adapters, open frame, and encapsulated, all models carry safety certifications for UL/EN60601-1 3rd edition safety standards. Consistent with the continuing medical industry increase in focus on safety, many models offer BF low leakage current rating, or CF ultra low leakage current rating, and 2 MOOP demanded by many applications today.